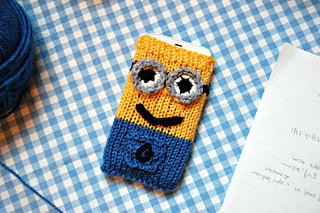 Inspired by the wonderful Minions of Despicable Me this happy phone cover would make an ideal present or something that will make your phone a little bit brighter! 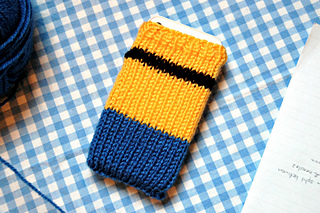 The main phone cover piece is knitted in the round which makes a seamless and safe phone cover (but please note this will NOT protect your phone if dropped!) 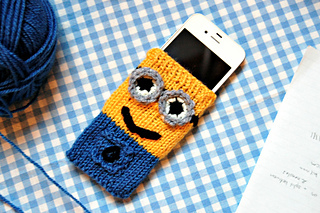 while the eyes and mouth are crocheted. If you can’t crochet you can knit circles for the eyes instead, or cut them out of felt, and a knitted i-cord would work just as well for the mouth.